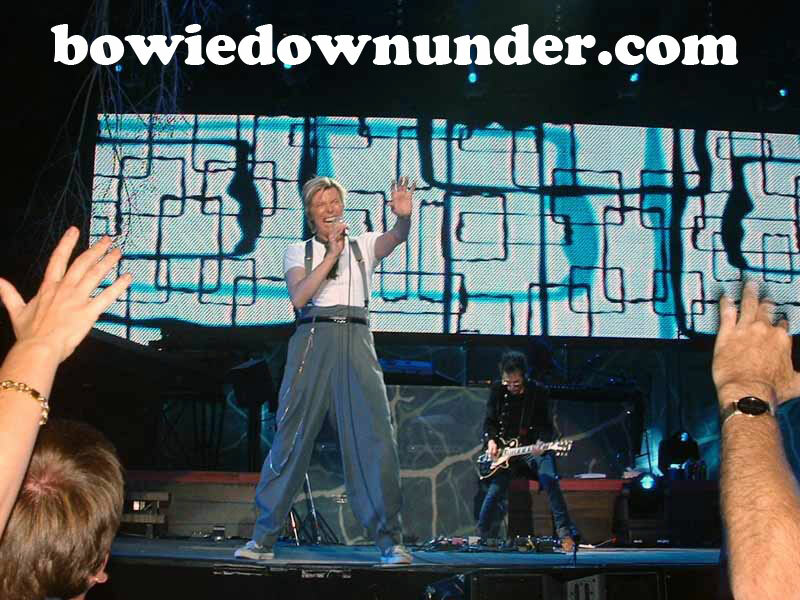 The dichotomy of David Bowie visiting Adelaide is a curious one. This is an isolated town, geographically and culturally, with a barely-there-Sunday-afternoon lifestyle. One wonders what Bowie must have made of his first visit here, playing Adelaide Oval adjacent to the massive, imposing St. Peters Cathedral. At the time the city's most outrageous-creative-pop- figure moment was Premier Don Dunstan waltzing into Parliament wearing pink hot pants and long socks. Despite his ten year helm and groundbreaking legislation, the media never forgave him. Not that a great deal has changed. The locals are still largely old fashioned, religious and conservative types with little demand for glitzy big name entertainment. Show business is for the East coast and represents an unwanted threat to the slow paced lifestyle. However, Adelaide is also a hungry place. Poker machines have pushed bands out of traditional live venues and most local talent head East at the first sniff of success. Tonight, this hunger seemingly lured out many casual fans who, were they offered the luxury of visiting international stars more often, may have chosen a different, safer entertainer. 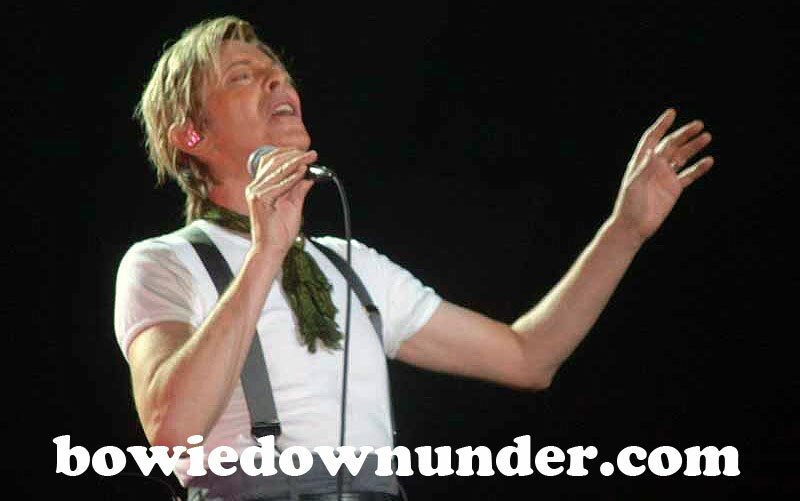 This presents Bowie with a platform to combine his classics with his newer, unfamiliar work to give the casual fans a greater appreciation of his talent, one of the few tasks he has struggled with. The fans milling about the complex three hours before show time affectionately call themselves the kooks. 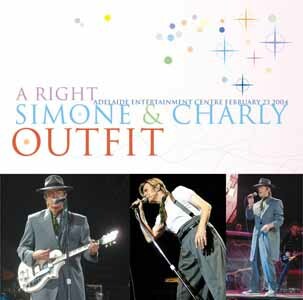 They model a visually stunning range of garments, obviously the product of a thousand garage sales and charity stores. These are strays, a neglected few struggling to find their place in a town that has no real use for creative types. They are individuals rather than a collective, and they are all charming and bond strongly through their mutual passions. Later the couples roll up, late 30's to early 50's and outnumbering the young kids four times over. 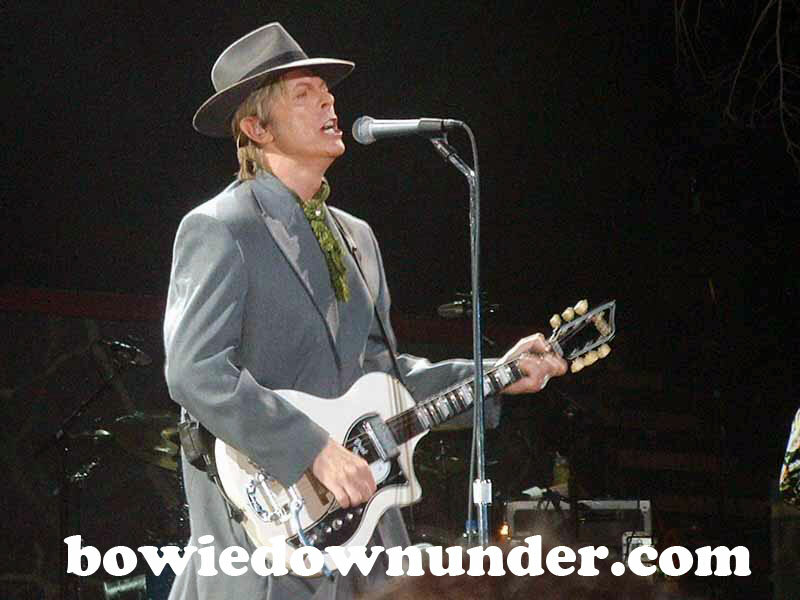 Some of the kooks view them as an easy target to criticize but the beauty is everyone can represent and claim Bowie due to his awesome range and appeal. Whether bisexual glam rocker, suave soul crooner or - presently - caring family orientated businessman with morals to match, it is attractive to watch the gathering assortments and realise just how many boundaries have been crossed and people affected by the music. Few knew what to think of Something For Kate, who are clearly suited to a younger audience. To their credit Paul Dempsy has a strong voice and great stage presence, frequently spoke with the audience and played tightly. The violin on "Light at the End of the Tunnel" was beautiful as was the penultimate track, a rocking cover of Echo And The Bunnymen's "Killing Moon". The elders around me remained unimpressed though, upon first impression likening them to a cheap REM. Personally I enjoyed them but surely there is a more relevant Aussie example of Bowie's modern day musical offspring to bill. Cut to this writer's most painful forty minute stretch, during which neither cigarettes or alcohol could calm my pounding stomach. Security offered some amusement, letting in bloodshot coneheads sporting coke can bong. Today the contraband is electronic recording equipment, any tool which may preserve our memories. Memories now days come preprinted in the form of merchandise stalls. Choosing not to give into temptation I returned to my seat. What first struck me was the bare stage, stripped of decoration save for some hanging tree branches. 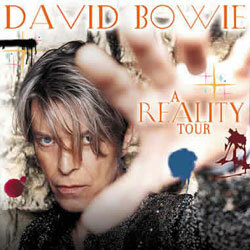 "Bowie ain' t theatre anymore" I was reminded, although the introduction was quite well done. We see a cartoon version of Bowie's band playing on the monitor, which slowly transformed into real video. Before I knew it they were onstage, straight into "Rebel Rebel" (Charlie's Angels 2 version) which was well received. He looked like he'd stepped straight from Absolute Beginners, complete with brimmed hat, long coat and baggy suit trousers. "Adelaide you crazy motherfuckers! How are you? Oh, play your music David Bowie". It was clear he was his jovial self. 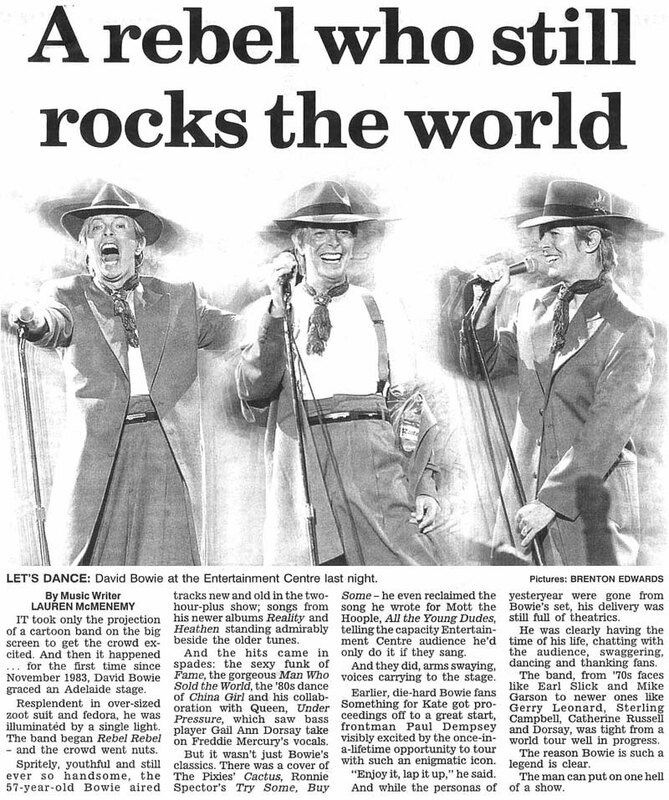 "New Killer Star" was well received, Bowie remarking "I love the smell of Adelaide in the evening" (was this a reference to the bong smokers? I couldn't imagine them getting away with lighting up indoors!). "Fame" was funky with fat bass, the monitors dropped frames in time to the beat and Bowie made the girls (and some boys) scream with some well-timed pelvic thrusts. "Well that was nice, thank you, you know we're just having a ball, just too good". The guy couldn't thank us enough. "This is a song by an American band who broke up, just reunited this year and we're very happy about that". The song was "Cactus", very similar to the album version. This was the moment I noticed Sterling Campbell's drum kit, he was pounding like crazy and sounded awesome. Earl Slick got quite jiggy with it. 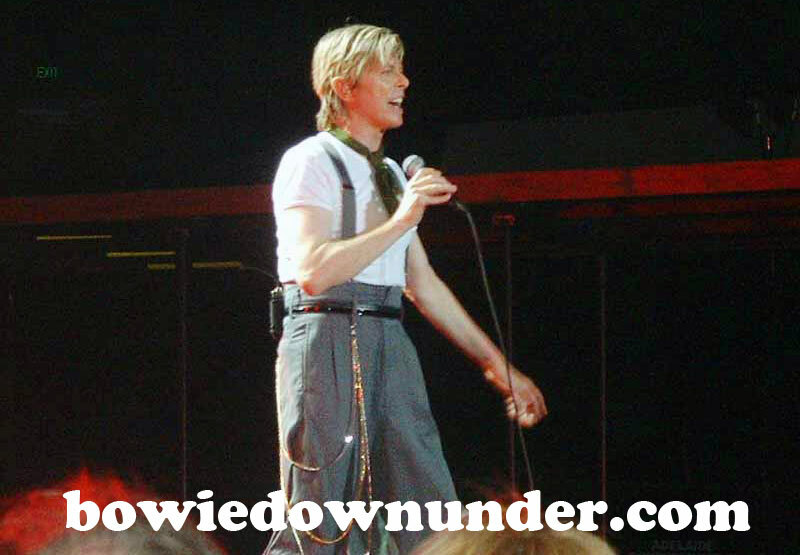 Bowie frequently joked about the audience not wanting new (post 1984) songs, at one point remarking "It's like he'll do an old one now because he just did a new one..... sneak out for a beer in between." The first real surprise was "Try Some Buy Some". Hell! This sounded a million times better than the album version, I was blown away. The guitars especially sounded good. The lighting was all sparkly and there were fireworks on the monitor toward the end of the song. He remarked "First time we've played that on tour, we'll guinea pig you a few more times tonight". This blew me away. "We'll do something you know, but you gotta sing along" and sing we did to "All the Young Dudes". I must say the guitar solos were spot on perfect, identical to the original. "That was really good" he joked, "You just made me feel unnecessary! Embarrassing when the audience is better than you! Makes you look in your pockets. I think I've got enough for the bus fare back to the hotel!" "China Girl" rocked with Bowie turning his back and pretending to make out with himself - he called it back language "I nicked that from Rudolph Nureyev". "I shouldn't have got you up like that because now I'm going to do a really quiet song" was his introduction to a stripped back "The Loneliest Guy". Lights were down and the background monitor showed Bowie walking through a forest (now I understood the meaning of the tree branches on stage) but his vocals were too way loud for the track. 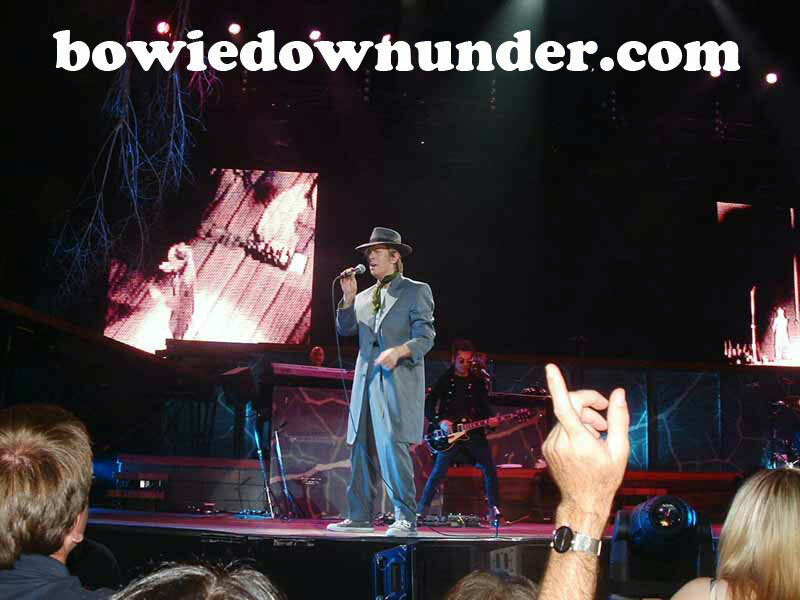 I should state the audio problems reported early in the Reality tour, such as Gail's backup vocals drowning out Bowie's lead, were fixed. Actually the audio was spot on, apart from "Days" where Gail's bass sounded fuzzy. Not good when the song's pace kind of relies around a lively bass tune. 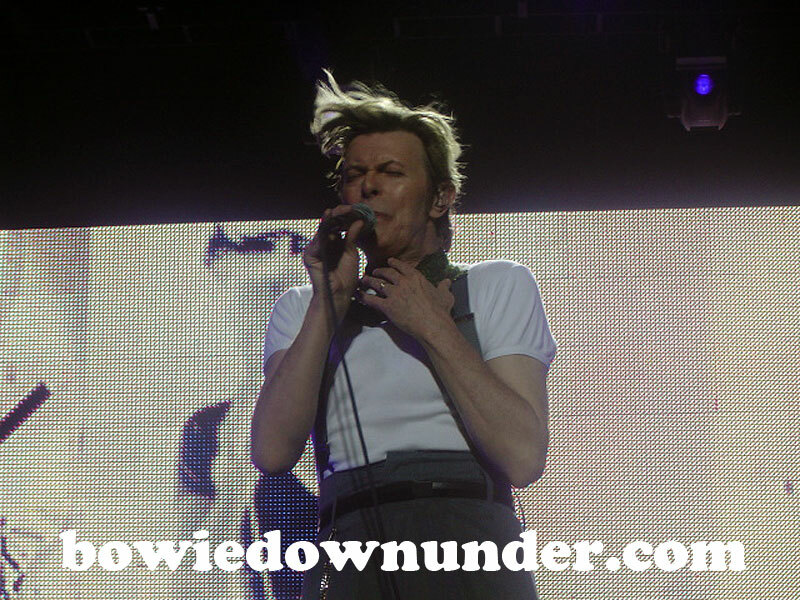 Bowie pulled out more jokes: "Does my hair look alright without the hat? I lost my jeans I usually wear so I'm wearing gardeners trousers! You take some shears and cut them, then take some hoes up the side. Oops, I didn't mean that". And later "These gardening trousers look quite like zoot suit trousers, it just occurred to me!" We thanked him and, ever the polite host, he thanked us back: "Thank you, that was great, you're really gracious. This is one of the first songs I got played on the radio in 1970, it means a lot to me. It's called "The Man Who Sold The World". "Hallo Spaceboy" followed and I must say I prefer the PSB dance version to 1.Outside. 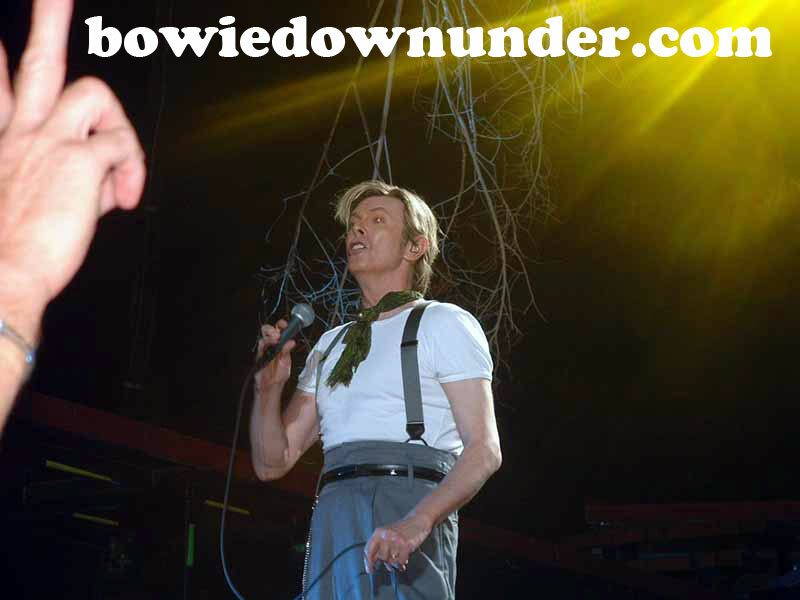 It seemed almost tedious with Bowie on a platform, unrelenting strobe lights and pounding repetitive drums. Bowie stayed on the platform for "Sunday" but the smoke machine failed and he walked off about a minute early for the outro - I could just see him in the darkness pacing about, I think he was a little pissed off. "Life on Mars" was charming, lights down and piano keys on the overhead monitor before the band joined in. Bowie again took up guitar for "Looking for Water" (funnily enough, the two people on my right then drunk from their water bottles, they were so transfixed). A good sport, he threw several picks into the audience. "This song we've only done twice on this tour" as he introduced "Quicksand". I went nuts but was surprised so few others cheered for this, the crowd was just not into this song. "Ashes to Ashes" was funked up, I noticed details like the monitors had a color/saturation/inverse effect on them similar to the video clip. Bowie also struck poses from the video - head drooping down from the scene in the padded cell and waiving a pointed finger during "better not mess....." section, I really loved such attention to detail. I never liked "I'm Afraid of Americans" but the chorus especially blew me away tonight. This was the night's heaviest song, Sterling's bass drum was shaking my chair and the guitars rocked. The girls were treated to some fancy crotch grabs. "Heroes" begun oddly enough although I realise it's impossible to properly recreate this song live with all the funny microphone levels and synths running in and out of tune. Still, his vocal delivery was outstanding and he kept pointing to the crowd.....very uplifting to us mere mortals. It also drew the first inkling of appreciation from many people around me who were just waiting for Ziggy tracks. They didn't have to wait much longer, as the encore featured "Five Years", "Hang on to Yourself" and "Ziggy Stardust". 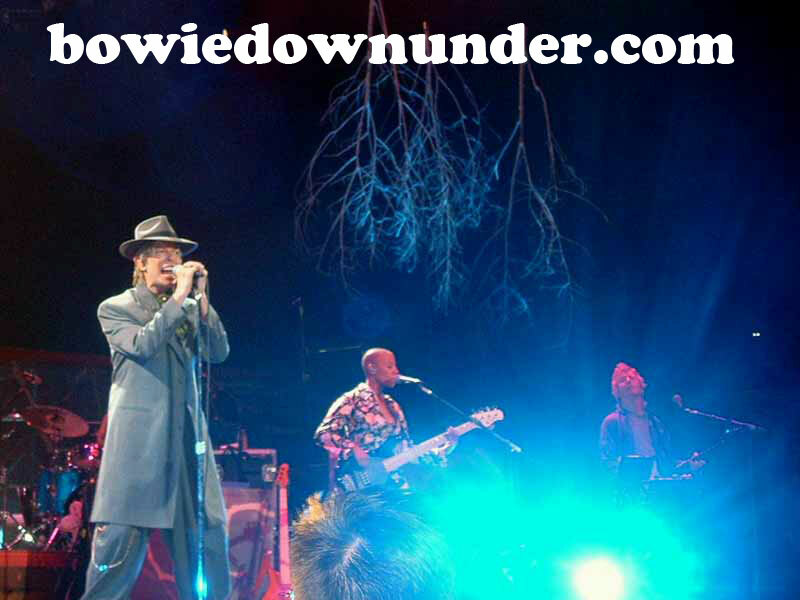 With all fans satisfied Bowie thanked us yet again, joined arms with his band, bowed four times and left the stage. 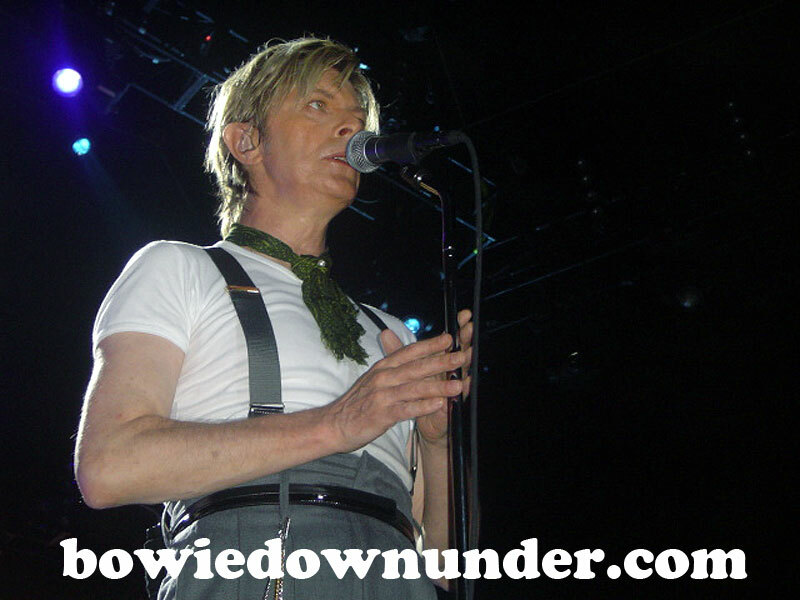 It is understandably difficult to stay enthusiastic in any field for a long period of time and my resounding feeling is I'm stunned Bowie seems so fresh and energetic after performing live all these years. He chooses to let his personality create a personal experience for the audience, not an easy thing for him to do when he performs in front of thousands of strangers every night. All I can say is I wish I had this guy's passion. The band was faultless. Everybody I spoke to afterwards was grinning and although it was a shame the night passed by so quickly, it was great to see all the happy excited people on such a buzz. If I had to complain, it would be that we got only one track from the Berlin albums and nothing from Station to Station, Young Americans and Diamond Dogs. But I can't complain when I just watched the show of my life. 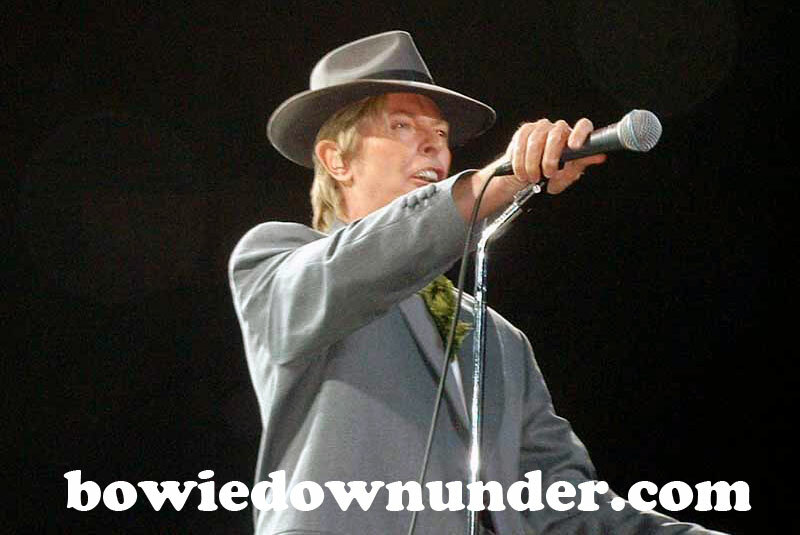 As for Adelaide, I'm hoping Bowie's spark will spread, even if it only inspires some to check out stages of his career that don't initially appeal to them. 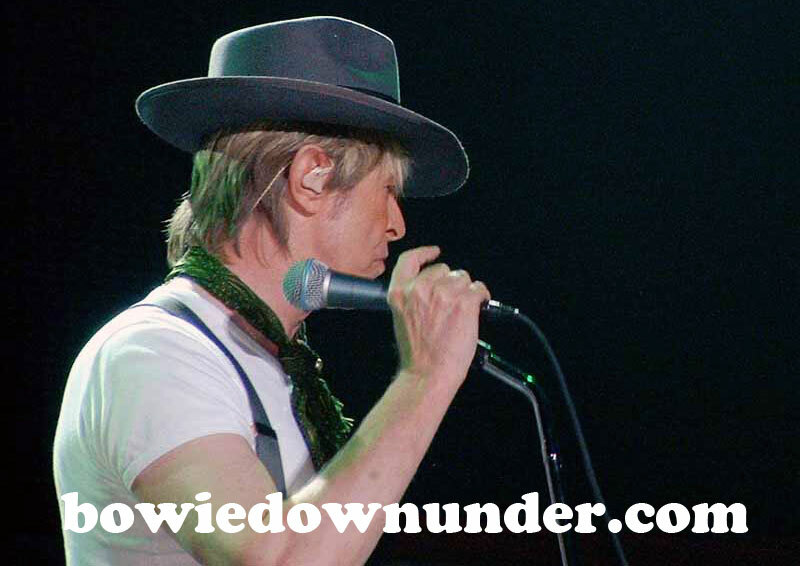 Bowie's message is that with a strong work ethic we can achieve the reality we desire. 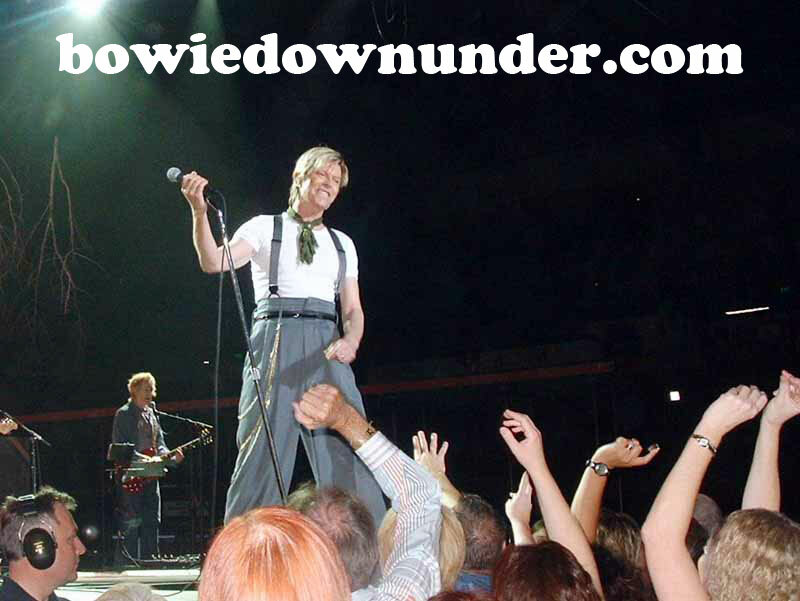 Before and after the Adelaide concert, Bowie Downunder members met at the Territorian Hotel in Hindmarsh. Located near the Entertainment Centre, this little pub provided an ideal drinking hole and great hospitality. The pub manager made us very welcome - and had gone out and purchased "The Best of Bowie" DVD for the occasion. Naturally, this had BDU members drinking and singing to the early hours of the morning and it gained some interesting reactions from the pub regulars. I recall one guy who could not speak a word of English (only Italian) and did not know any Bowie - until we sang 'Volare' (to us, an obscure Bowie number from the Absolute Beginners soundtrack but for him, a very famous song in Italy!) Special thanks to Fed Up for providing these laughs. Bruce, Margot and Julie at The Territorian. Adelaide, Feb 23. For more details, click here. Adelaide you crazy mother fuckers - how are you? Good. Good. Play the music then Bowie. Oooh. I love the smell of Adelaide in the evening. Well that's nice. Thank you. You know that's really nice. 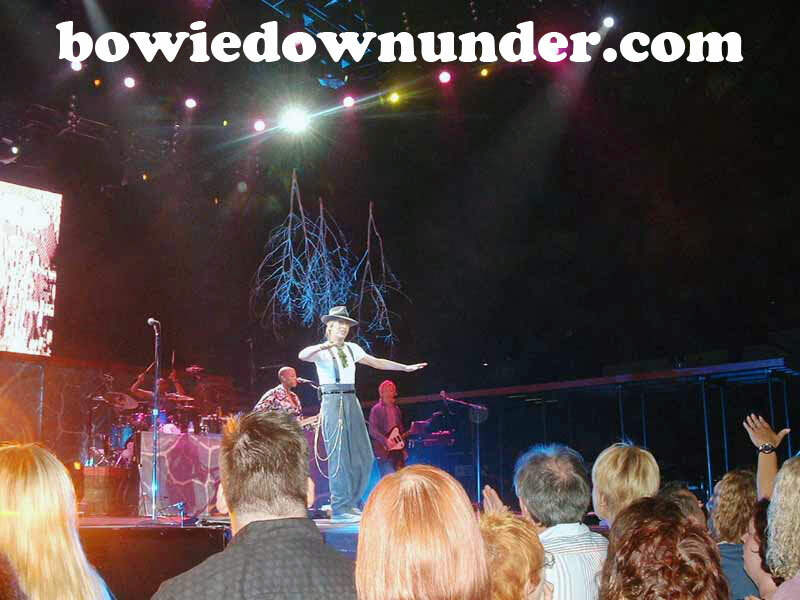 Well this is a great Oz trip - we're having a ball. Just too good. Too good. We're going to do a couple more new ones, alright Davey. There's my tie clip. That was really good. Oh yeah that was really good. It's made me feel quite unnecessary actually. And you know it's a worry because you're here and your singing and the audience does it better than yourself and you think how much money have I got? Enough for a bus fare back to the hotel? I'll do one more though.......before we go. Thank you. I had this great one in the 70s. It's cool that I nicked that Rudolph Nureyev. Right I know who the old ones are......go over there. What shall we do now? Does my hair look alright with that hat? I should put my hat back on. I'll tell you - I lost my jeans......and now I have those old gardening trousers. I'll get some sheers and a hoe down this side. I didn't mean for that to come out like that. So how you doing, alright? I shouldn't have got you up like that because I am going to do a really, really slow song. This is the first gig we've done together and I am really, really impressed. Let's see if I can get your names right. You're. 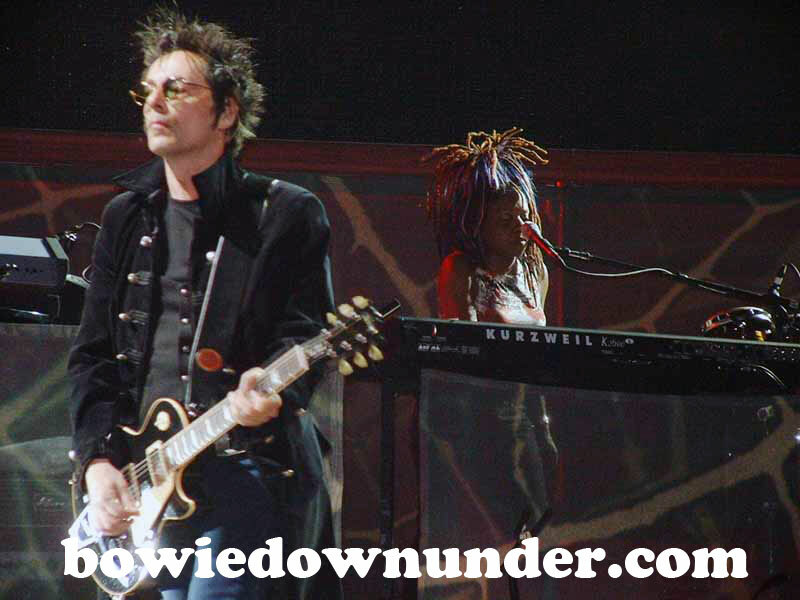 You're I know - you're Earl Slick on guitar. You could be Mike Garson on keyboards. And you're definitely Catherine Cat Russel on keyboards and a hundred other things. Got this one - Sterling Campbell on drums. Now this guy turned up this afternoon with a trombone but we're like we're not going to use a trombone - learn guitar. So from 5 o'clock this afternoon - his fingers are bleeding - but he learnt to play the guitar......it's Gerry Leonard. Sharon - is it Sharon. There was a song that I wrote with Freddie Mercury in the 80s and ah, I'd like to do it now. Of course I am going to do it now otherwise I wouldn't have mentioned it would I? Ah and the part that Freddie beautifully sung is going to be even wonderfully sung tonight by Gail Ann Dorsey. It's like. So it's like - he's just done a new one maybe now he does like an old one, right? What do you reckon? Slip out for a beer while he is doing another new one. But you liked that last new one didn't you? [sings] Da, da, da, da, da, da. I'm just filling in time so they can get their guitars on. Da, da, da, da, da, da. He said righteously. BUT. We've had a wonderful time. Thank you so much. Thanks for a great night. Thanks very much. Welcome to our show. Thank you very much. This ones for you.